Batangas: Save the Bauan Municipal Hall & Bauan East Central School! 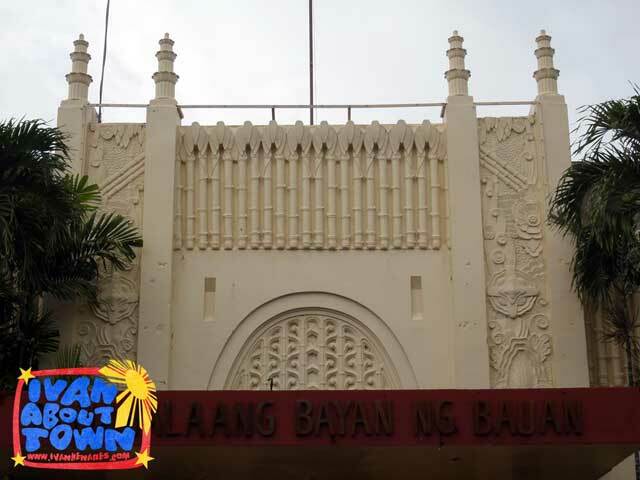 The Heritage Conservation Society - Batangas Chapter found out that the Bauan Municipal Hall, an exceptional Art Deco building in Batangas, is scheduled for demolition next month. If this is true, it violates Sec. 5 (f) of Republic Act No. 10066 which prohibits the demolition of structures fifty years or older without the approval of the NCCA. There is also a proposal to demolish the Bauan East Central School for the construction of a terminal. "The decorative screen of the central bay of the main facade is the most elaborate, with its stylized depictions of agricultural products. The decorative screens of the flanking bays take that theme to a further level of stylization and abstraction. The furthest level of abstraction seems to be reached at the clerestory screens of the school. "Now, whether there was an actual and literal link between the architecture of the municipio and the school - for example, was the school designed by an architect who apprenticed at the firm that designed the municipio, etc., or was the architectural profession back then just that much more in tune with the genius loci or spirit of the place that all structures shared a responsiveness to it - I don't know. "But what I do know is that if those structures are demolished, what will replace them will most likely not hold a candle to them. They won't even strike a match. Much of what my profession builds today oscillates between the vacuous and the vapid." According to Architect Melvin Patawaran of DepEd's Heritage Schoolhouse Conservation Program, "The [Bauan] Gabaldon has a unique callado design and has a nice vista from the street as it is placed on higher ground." He adds that he plans to recommend the Bauan East Central School for inclusion in next year's conservation program. 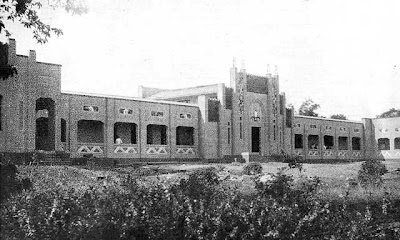 We appeal to the Municipality of Bauan, Batangas to rethink their plans and incorporate this unique Art Deco facade in the new municipal hall they plan to build. There are so many restoration architects from the Heritage Conservation Society and ICOMOS Philippines who can give sound advice to the LGU on what to do. 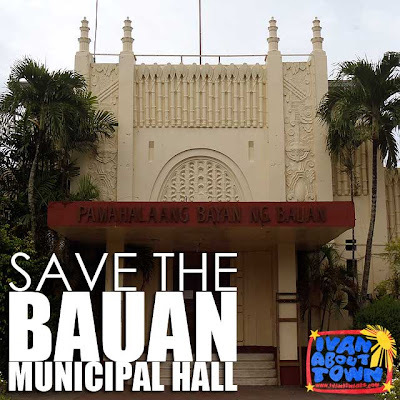 Don't forget to like the Save the Bauan Municipal Hall page and help spread the word! 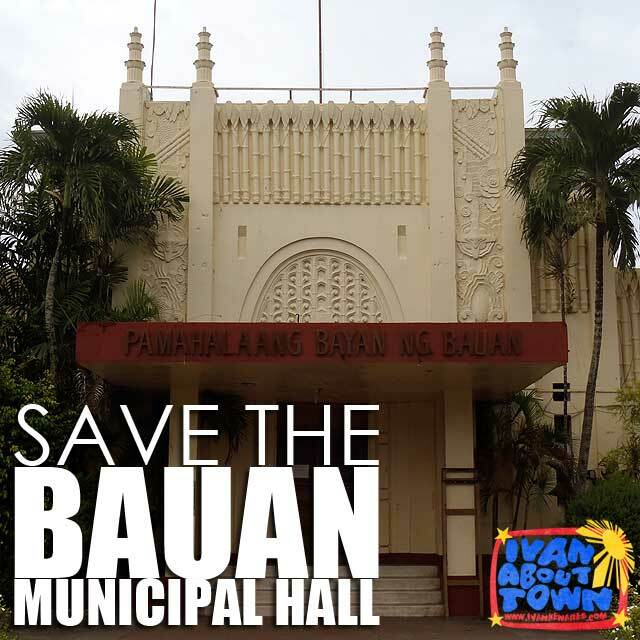 Let's preserve the Bauan Municipal Hall and Bauan East Central School! 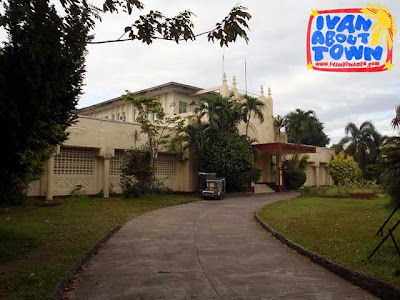 Update (10/08/11): We just found out from Prof. Gerard Lico that the Bauan Municipal Hall was designed by Architect Juan Arellano, one of the early masters. He designed major landmarks in Manila including the Metropolitan Theater, Post Office Building and Legislative Building (now the National Museum) among several others nationwide. With this important piece of information, efforts to preserve the Bauan Municipal Hall must be pursued more vigorously. On behalf of the concerned citizens of Batangas and the Heritage Conservation Society (HCS), we sincerely urge you to stop the planned demolition of the Bauan Municipal Hall scheduled on October 15, 2011. The Bauan Municipal Hall is an exceptional 1930s Art Deco building attributed to the great Filipino architect Juan Arellano, who also designed the Legislative Building, Post Office, and Metropolitan Theater in Manila. This makes Bauan unique and culturally important which can be used to enhance the town’s economy. Related to this, by Republic Act 10066, known as the National Cultural Heritage Act of 2009, the Bauan Municipal Hall’s age and architectural significance make it an Important Cultural Property protected from demolition without the approval of the National Commission for Culture and the Arts (NCCA). We in the HCS are not against the construction of a new and larger municipal building in Bauan. Instead of demolishing the existing building, however, we propose that it be repaired, renovated and integrated into the new structure to accommodate the space requirements of the municipal government. This approach, called Adaptive Reuse, is practiced in many cities all over the world. It has proven to be an effective means of conserving valuable heritage structures, thereby preserving the city’s unique and distinctive identity, while at the same time accommodating the construction of new structures to meet contemporary needs of the community. The HCS, as the government’s strongest ally in the conservation of heritage assets, urges you to stop the planned demolition, and to consider the alternative of Adaptive Reuse. Also present were Mr. Derrick Manas of the Batangas Heritage Conservation Society and Voltaire Altavas. 1. The HCS team was very impressed with the distinctive Art Deco architecture particularly the facade, and the fact that it was in good condition. According to Architect Rene Luis Mata, the façade of the existing municipal hall is original and clearly a Juan Arellano design because of its striking similarity in degree of detail to the Metropolitan Theater. 2. The HCS team also noted the addition of certain features to the original structure, such as the concrete canopy over the main entrance to the building, the precast concrete sun baffles on what used to be openings of the front corridor of the building, the concrete eaves over these openings (presumably to prevent rain from entering the openings), and concrete decorative pillars supporting the eaves. These additions were reportedly made in the 1960s. 3. The HCS team found the inside of the building to be in urgent need of improvements. There were people sitting on the floor, suggesting the lack of space to accommodate visitors conducting business with the municipal offices. There were a number of offices without windows. The entire interior reflected the building’s old age and need for additional space. 4. The HCS team also noted that demolition of parts of the interior has started, although the facade remains untouched. 1. The HCS team reemphasized its recommendation that the facade of the existing building be retained and integrated with the proposed new building based on the very high heritage value of the existing building and the fact that the design of the new building can still be altered to enable this integration. 2. Arch. 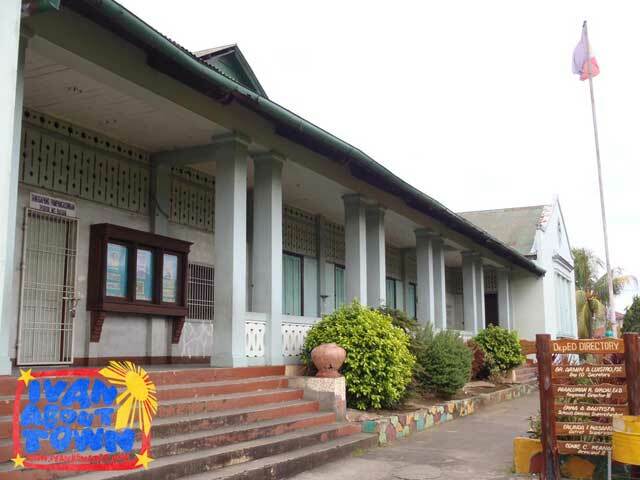 Mata cited that among three known municipal buildings designed by Juan Arellano, namely Bauan, Jaro, and Sariaya, the Bauan Municipal Hall was the most outstanding. Ivan Henares added that it would be most beneficial to Bauan if it were conserved as it can catalyze the tourism industry of the municipality. 3. Atty. De Lacy and Engr. Cabral explained that the building burned during the Second World War, and that repairs were made to make it usable. They mentioned that subsequent additions were made to the facade in the 1960s, and because of these additions, the building is no longer original and, therefore, not covered by the provisions of RA 10066 (requiring that buildings 50 years and older cannot be demolished without the approval of the NCCA). 4. The HCS team explained that regardless of whatever was added to the façade, the basic building is still original, because it is still the same façade built in the 1930s. New features added to a heritage building do not make it less older than it already is. The team explained that these additions can be easily removed so that the façade can be restored to its 1930s look. 5. Atty. De Lacy expressed their concern that the integration of the existing building’s facade and the new building might entail additional cost. The HCS team explained that this can be avoided by properly designing the integration. 6. The idea of relocating the façade of the existing building to another location on the site was brought up by Engr. Cabral. He cited his concern about the high cost of doing this. The HCS team agreed that such a move will indeed be costly, and that it is not advisable to relocate the facade anyway because doing so violates the principles of heritage conservation. Atty. Castillo added that transferring the façade may cause damage to it. 7. Engr. Cabral also brought up the idea of incorporating a replica of the facade on the new building. The HCS team explained that this idea runs counter to the fundamental principles of heritage conservation as cited in the Venice Charter (see Annex). 8. Atty. Castillo suggested that HCS, the NHCP, and Archt. Quin Baterna, the architect engaged by Bauan to design the proposed new building, meet as soon as possible to come up with the appropriate design integrating the facade of the existing building with the proposed new building. He emphasized the importance of coming up with a solution that would meet both the needs of Bauan for a better and bigger municipal hall and the objectives of HCS in conserving the existing municipio. The HCS team agreed to this and assured the Bauan officials that it will do its utmost to make sure that the construction schedule for the new building will not be affected by the preparation of the integration design. 1. HCS will meet with the Historic Preservation Division of the NHCP & Archt. Quin Baterna to help them come up with the best solution for integration of the Art Deco façade with the new municipal building. 2. After the integration of the façade into the new municipal hall, the HCS will assist Bauan in formulating a tourism program in coordination with neighboring LGUs. Oh please, save those heritage structures! they connect us from our past. They are our history, part of our culture. this is barbaric!...let me know how i can help...remember jai-alai? For people who are asking what is Art Deco and it's importance in ciulture and design here are some infos on the design style. The murdered Jai-Alai building along Taft Avenue is classified under the Streamline Moderne Art Deco style. Are you kidding me? Why is it that we don't know how to preserve our history? Shame, shame, shame!!!!! Don't let this happen!!! Parang sumakit ulo ko dito ah! Two birds in one stone ang banat ng mga taga-munisipyo...hay. It goes to show they don't appreciate art and they slept during history classes. Why demolish? I haven't seen it but it looks beautiful to me. If its old, just repair it. If it does not serve its purpose, change it to a museum and archive your old files in it and byild a new one beside it. In Europe, that's what they do. Cesar, what is the UAP Batangas doing to help? What for you have a UAP and you can't be heard! Aargh! what are they going to do with the muncipio's lot? This is so bad. Its a one-two punch for our beautiful heritage. You said "There are so many restoration architects from the Heritage Conservation Society and ICOMOS Philippines who can give sound advice to the LGU on what to do." And if they (the LGU) are insistent to demolish the structures, all we need is one good lawyer to sue them so they would stop doing this. Its clearly a violation of R.A. 10066.
so beautiful..save our heritage..save our landmarks..! You will not be remembered by the monuments you built but by the ones you destroyed. Seriously, these people need face slapping and more than that crash course in Heritage Conservation. to ivanhenares: oo nga e.
Oh God! Let it not happen. It makes no sense. Historical landmarks are of higher value more than anything else. Arggh. PRESERVE! PRESERVE! PRESERVE! We just found out that the Bauan Municipal Hall was designed by Juan Arellano. It is indeed a treasure! Then that would make it in the same league as the Metropolitan Theater in Manila! There are ways to make bigger structures, but preserving historical treasures. I have seen this done in Singapore and Berlin! My maternal grandfather (Juan Contreras Alabastro) was from and lived in Bauan, and I used to spend some of my summer vacations there when I was a child. The municipio is smack in front of a T-junction. I remember that directly across it were two corner buildings: one was my grandfather's ancestral house, and the other was the Bauan Rural Bank which he established and managed until he died. I haven't been back there for years and don't know what has happened to these buildings. I support the conservation of the municipio. hey that's my school!!! PM to ryanh sent..will try to get as many schoolmates rally against this offense to heritage. thanks ivan! Thanks Shei! If you can text him too, that would be great! How come their municipal engineer said it was only a 45 year old building. I don't think they know the history of their own town. No wonder they want to tear it down because they don't know the historical value of their own municpal building. My God! those town officials should seriously consider about destroying that building. what floods and earthquakes did not destroy, misguided town leaders may yet accomplish..this should not happen. Wow! This is my hometown hall right here. And it's still up until now but kinda dirty already. Thanks to the well-meaning gents and ladies comments about our municipio. I was born and grew up in Bauan, 87 years ago, still actively engage in the practice of law and I probably know a few things more than any of my young friends, about the community, its people, place and buildings, culture and what have you. They forgot that the original municipio was totally burned in 1945 by the Japanese soldiers and was reconstructed in 1964. Now, it is not the same structure built in 1930. Please visit us and see for yourself the necessity of a new building. I've seen it myself. The building at the back is new. But the facade is intact. That alone is worth preserving. Which is why we are asking that the said facade be incorporated in the new design. Just checked my file of photos of Bauan Municipal Hall. Contrary to what the honorable mayor claims, most of the facade is still that of the original albeit with additions, such as the post modern posts along the arms of the building as well as the concrete overhang over the main facade. But restored sympathetically can be brought back to its original look. Most likely the additions the mayor stated was done in the interiors. taga-Alitagtag po ako pero sumusuporta po ako sa anumang layunin na protektahan ang mga katutubong kultura, musika, at sining saan man bahagi ng bansa at mundo. mabuhay ang bayan ng Bauan! HCS, together with other heritage lovers and enthusiasts out there, is NOT against a new municipio. Rather, we are just asking (and thanks to RA 10066, demanding) that the facade be kept as it is and better yet restored to its 1930s look. You see, 1930s may not be as old as Vigan's 1800s houses, but in a hundred years they will be. And Bauan may regret having destroyed an architectural jewel. Nawala na nga yung likod, sisirain mo pa yung harap. I grew up here, The hall is my playground, the municipallibrary and the people in the mayors office were my supporters and my power movers. Big Mama as we call the former leader then, was an inspiration. It's quite nostalgic and can't help but to feel so sad. I'm hoping that the town that refuses to die will be in good hands. 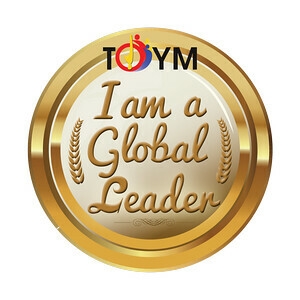 Leadership is not a perk but a responsibility, To whom is given much is required. My prayers goes to the Bauanguenos who still believes in good governance. they continued with the reconstruction, but then saying the loan is approved but the money was not yet released, it's more than a year and people are aggravated because of the lack of improvement in the construction,.. nahahati na ang bauan nag aaway away ang mga tao,.. kanya kanyang banatan,..
Mam/Sir hinahanap/inaalam po namen ang birthday ng lola ko. Dyan po sya ipinanganak s Bauan. Mga nasa 1938 or 1939 po. Hindi po niya matandaan ang kanyang birthday at ang birth certificate po nya ay nasunog daw po nung panahon ng Hapon. Nakikiusap po ako sa inyo na sana ay matulungan po ninyo ako.